I like McDonald’s. The place tends to get a bad rap, but if you’re craving something junky and quick, it (usually) hits the spot. I’m sure a childhood’s worth of nostalgia helps, but there’s always going to be a place in my life for the occasional visit to the Golden Arches. 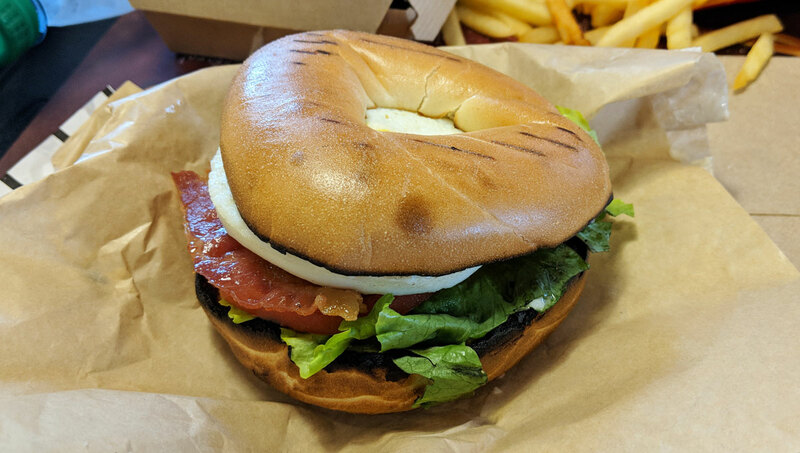 That being said, the Egg BLT Bagel was super duper gross and you should absolutely never eat it. I got it on a plain bagel, which was overly sweet and substantial. The egg was dry and overcooked, the bacon was paper-thin and soggy, the lettuce was so stingy that it may as well not have even been there, and the mayo overload meant it was impossible to eat without making a greasy mess. There just wasn’t a whole lot of flavour here, other than the sweetness from the bagel. The tomato was okay, though, so… hooray for that, I guess?